Gameplay: Cleopatra invites you to her palace apartment in Alexandria. It is at your disposal. There is .pdf manual installed with the game. The options selection is at the pillar area. The pillar has the overall volume, the globe has the rotation selection, left scroll on the table has the subtitle selection and the scroll at right has the object info selection. Play selection is towards the corner table left of the room. The table has 5 statues-avatars for your game profile selection. 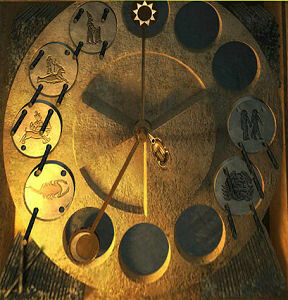 Click on the statue to get a selection of the zodiac seen on the wall above the profile selection. The sign you choose will influence events in the course of the game. The open entryway at right to the balcony is new game. The saved game stand is across the profile selection. There are unlimited saves. The door to the right of the stand is the return to the game. The load game is found under the profile selection. Select a scroll and see the picture of a saved game. The latest saves are at the bottom. Quit game is on the opposite side of the room towards the stairs going out of the room. The credits and gallery are seen on the frames on the wall right of the quit steps. The gallery has the movies and music of the cinematic. Right click during gameplay accesses the gameplay menu. The left pillar's top icon is for the main menu. The eye is the notebook and has the thoughts of Thomas. Read it to see the progress of the game. There are arrows at bottom to go from one page to another. The man icon has the game's dialogue history. The bottom of the left pillar has the selected zodiac sign and shows that day's horoscope. The center of the screen has the storage for inventory. It has 6 tabs or pages for items. The right pillar's top icon has the transit storage frame. The pyramid icon has the map of Alexandria that is used to jump from one place to another place visited . The disassemble-empty icon is the third icon used to take an object apart or empty a recipient. The X icon is the return button. The ESC key or left mouse key skips dialogues and cutscenes. Cleopatra is at war with her brother-spouse Ptolemy. The city of Alexandria is in a bloody civil war. You play Thomas the Chaldean, a student of astrology and astronomy in Alexandria. Akkad is his teacher and mentor. Iris, Akkad's daughter is Thomas' guiding light. They lost contact due to her helping with a commission that Akkad is doing for an unknown person. Thomas visits the observatory to see if the work is nearly at end. Note: The gameplay changes from one player to another depending on the zodiac sign selected. The day's events are affected by that day's horoscope. It can be a good day or bad day depending on the favor of the Gods. The puzzle difference during gameplay is noted by a sound and brief rain on the screen. When the game is completed 2 new signs are opened. One, all good days and the other, all bad days. On the way to the observatory, see blood on the pavement. Turn around and click on the door to see that it is intact. Turn around again. Click on the earthenware jar in front of the right sphinx. Take the strip of papyrus. Akkad's bronze pyramid: Follow and click on the trail of blood. See Akkad's pyramid ahead. Bad day: Go forward from the jar and turn right. Take the papyrus stalk on the ground. In front of the side of the pyramid baked by the sun, pick up half of a broken stick (half of a scytale used to decrypt a message written on a strip) and Iris's writing case from the ground. Check the zodiac signs around the pyramid. Turn left and go forward. Bad day: Look left before the bridge going to the sphere area. Pick up another papyrus stalk from the ground. Turn right before the bridge and go forward to the other side of the pyramid. Eros: See the statue of Eros missing the arrow. Observatory: Go forward to the left corner of the building ahead. Look left and see trampled plants. Pick up Akkad's half crown. Turn around and pick up part of a theatrical mask from the ground. Go right to the building's door. See trampled plants right of door. Knock on the door. Where could they be? Turn back and forward to the pyramid. Go across the bridge and see the statues of Horus and Anubis facing the mausoleum. Akkad's Mausoleum: The mausoleum is across the pyramid. We cannot enter yet. Look down on the water in front of the pyramid and see the rhinoceros heads' overflow blocked by reeds. There's a papyrus there also. Continue on to the bridge right of the mausoleum. Pick up another piece of stick at right before the bridge. Closed Gate: Go forward to the closed gate framed by 2 Hippopotamus waterfalls. Turn around and pick Iris' precious bracelet from the ground. Wall: Cross the bridge and be close to the wall with scaffolding. See arrows flying outside the wall. Good day: Pick up metal hook and pot of bitumen close to the pile of bricks. Bad day: Pick up metal hook, pot of bitumen and leather strap from the pile of bricks. Turn around and look at the statue of Eros. This one has an arrow. Stick - In inventory combine the 2 sticks and the pot of bitumen to get mended stick. Then combine the mended stick and the strip of papyrus taken from the jar. The person who ordered the divination has sent someone to kill him. Water drain: Go back to the papyrus in the hippo water drain in front of the mausoleum and pyramid. Use the metal hook to get the papyrus. It floats downstream. Good day: Use the metal hook to get the papyrus caught on plants close to shore. Bad day: The papyrus is caught on plants far from shore. In inventory, combine the 2 papyrus stalk with the leather strap to make a long pole. Use the long pole to get the papyrus. Wet papyrus: The papyrus is unreadable and wet. Go to the sunny side of Akkad's pyramid. Use the wet papyrus on the sunny side of the pyramid to get dried papyrus. The papyrus is still unreadable when used with the stick. Use the papyrus with the writing pad and then use the readable papyrus with the stick. Iris writes: They injured my father! Go into the observatory. If you can correctly name the arrow constellation and the 2 places it points to, then Sagittarius and Eros will open the doors for you. Sphere: Go across the bridge left of the pyramid and see a globe covered with constellations. 1. Based on Iris' clue: Look for the Arrow constellation. Click hold to turn the globe. Place the cursor over the Arrow constellation and the name of the constellation can be seen at top right of the screen. 2. Name the arrow constellation. 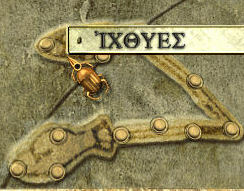 Using the label of the constellation in Greek letters, enter the letters by pressing the correct Greek letters seen at the ring at the middle of the globe. Click-hold to turn the letter ring. Place the cursor over the letter and the name of the letter can be seen at top right of the screen. The letters do not repeat, so once it is pressed down, continue to look for the next letter to be entered. Thomas will say when the name is finished. Enter: beta, epsilon, lambda, omicron and sigma. See the stars in the constellation light up. 3. Name the 2 places it points to. The arrow constellation points to Pegasus and Pisces. Enter for Pegasus: pi, eta, gamma, alpha. Pegasus' stars should light up together with arrow's star. If wrong, it will not light up or arrow's stars will dim. Enter for Pisces: iota (with apostrophe before the letter), khi, theta and upsilon. All the 3 constellation's stars should light up. See the Eros with no arrow move its arm and bow. Wall: Go back to the Eros statue by the wall of the garden. Good day: Pick up the intact arrow in front of the pond. Bad day: Pick up the broken arrow that nearly hit you. Eros by pyramid: Go back to the Eros with no arrow. Bad day: In inventory, click the broken arrow on the disassemble icon at right to get arrow tip and arrow feathers. Combine arrow tip, arrow feathers, mended stick and pot of bitumen to get assembled arrow. Click to position the bowstring. Place the arrow on the Eros statue. Click on Sagittarius symbol that popped up on the pyramid. Oops, too high. Pick up the arrow and place it back on the bow. Position the angle of the arrow by clicking on Eros. Click it to the middle position. 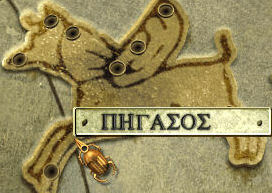 Click on Sagittarius and the arrow hits the eye of the animal on the wall of the Observatory. Observatory: Enter through the secret door. The main door opens. Akkad's workshop: Take Akkad's notes on the shelf left of the door. Akkad needs the ancient tablets of Enuma Anu Enlil to decipher the stars for Cleopatra. Go to the left and take the Heliolab note from the end of the stone shelf. The heliolab is used to contact the Queen's emissaries by encoding the current Chaldean month. Take the tablet mold and clay from the box on the floor. Turn around and down. Take the lighter from the stool. Akkad's workshop: Go forward to the worktable. Pick up the letter from Akkad to Iris and the small pliers from the table. The letter gives the commission: to find out if an alliance with Caesar will enable Cleopatra defeat her brother. Look up and take the notched rod (9 notches) beside the lamp on the shelf. Look at Akkad's universal calendar on the wall above the worktable. Today is the first day of the month of Arasammu and the 208th day of the year. Turn around. Pick up the papyrus with months from the chair in front of the other wall scroll slots. It is a list of months according to Chaldean calendar. The month before Arasammu (ARASAMMU) is TASRITU. From the above clues, we know the month to encode on the heliolab - Arasammu. Now, we should encode the heliolab. Terrace: Move the curtain at right and exit the workshop. The door to the reception room is locked and the main doors are open. Climb the stairs to go to the terrace. See Akkad's heliolab. Take the ancient rod for tags that has preset tags already from the heliolab. Pan left and open the chest. Take the papyrus with codes from the chest. It shows the arrangements of the tassettes or tags. Go forward and see Akkad's astronomical instruments. Take the clepsydra, a time counter by water flow. Turn around and see a sun dial. Go back down to the workshop. Arrange the code on the heliolab rod: Go back to the worktable. Study the arrangement of the tags on the ancient rod. It has large, small, large, large, small, large and small. Look at the papyrus with codes. Look for the arrangement similar to the one on the ancient rod. The arrangement below it must be the one for Arasammu. Bad day: Take the small board propped on the worktable. Pick up the small tassette-tag from the basket. In inventory, combine small board, small pliers and small tassette-tag to get pile of tags. Place pile of tags on the empty basket. Place the notched rod on the slot on the table. Using the tags from the 2 bowls on the table, place from left to right: small, large, small, large, small, large, large, small. Pick up the newly prepared rod with tags. Send the code on the heliolab: Go back up to the terrace. Place the rod with tags in the end of the ornate cylinder at the bottom part of the setup. Turn the rod at the other end to wind the spring at the center. Push the small metal plate on the ornate cylinder close to the rod with tabs. See the message sent. Thomas meets with Queen Cleopatra. Akkad and Iris were taken by Ptolemy. Thomas was ordered to find the Enuma Anu Enlil. While her soldiers are in the trail of Akkad and Iris. Go back to the Observatory and the workshop using the 'jump to' of the map. Go to the right corner of the room. Open the cabinet on the wall left of the scrolls. Take the scroll that tells the Story of Enuma Anu Enlil. Learn the fate of the tablets. Pan right and take the letter from the librarian from the wall scroll slots. Aristion of Perganum, the librarian will give the gathered information about the tablets to Thomas. Library of Alexandria: Jump to or exit through the main gate to go to the library. Crocodiles are in the library grounds! Pick up the broken necklace from the bloody cloth in front of the closest crocodile. Click on a crocodile and realize that they are not Nile crocodile but from the Temple of Sobek. Go forward using the right side of the pond. Good day - In inventory, disassemble the necklace to get a papyrus. Bad day - At right side of pond, pick up the stone. Use the stone on the broken necklace to get the papyrus. 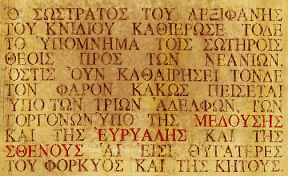 Read the papyrus to see the clue in finding the secret hiding place. See boxes close to the entrance. Try to pick up the ushabti figurine or the Sobek (crocodile) statue. An old crocodile guardian arrives. He says that the Temple of Sobek was sacked and the priests were killed. He wants all Greeks killed. As retaliation, he and his crocodiles came here to the library and killed everyone. He is mad. The mad old crocodile guardian is preparing for his death. He wants 2 or 3 ushabti figurines to serve him in the afterlife. He will let you pass if you can get him 2 more aside from the one he has on the table. Take the ushabti figurine from the table. Akkad's Workshop: Use the map to jump to Akkad's workshop. Molds - Get 2 clays from the box by the curtain. In inventory, combine tablet mold, clay and ushabti figurine to make unbaked ushabti half mold (front). Do it again - combine tablet mold, clay and ushabti figurine to make unbaked ushabti half mold (back). Get 2 clays from the box by the curtain. Bake the molds - Go to the kiln. Take dry leaves from the floor at right and place it in the kiln. Use the lighter on dry leaves to make a fire. Add coal taken from the box on the floor on the fire. Do this 3-4 times or until Thomas says enough. Place half ushabti mold (front) on the embers. Take the kiln tong hanging on the left and keep it ready (over the mold) to pull out the mold. Wait until Thomas says it is ready; then use the tongs to take the baked ushabti half mold (front). You might need to build the fire once more. Do as above. Do the same thing for the half ushabti mold (back) to get baked ushabti half mold (back). Figurines from mold - In inventory, combine the baked ushabti mold (front), baked ushabti mold (back) and clay to make unbaked ushabti figurine. Make 2 (Good day) or 3 (Bad day) figurines. Build the fire again. Place one unbaked ushabti figurine in the kiln at a time until you have 2 (good day) or 3 (bad day) ushabti figurines. Before you leave, have 2 clays in inventory to save jumping later. Library of Alexandria: Jump to the library and place the ushabti figurines on the table. Talk to the old crocodile guardian completely. Now the old crocodile guardian wants to be shown how to weigh his soul. This process needs 4 God statuettes. Observatory Garden - Mausoleum: Remember this is where Akkad's mausoleum is located and he prepared for the afterlife already. Jump to the Observatory Garden. Go to the mausoleum and look close at the door lock. Open the door: The door lock has 4 holes on top and 3 plugs on the front. In between are hieroglyphs. Read the hieroglyphs: I was born at one; at three already a man I was; at five I was aged, past my prime; when nine shall chime the hour, the tomb gates shall open. Pull the left plug and see water flow out. It's a water lock! Go to the hippo waterfall beyond the bridge right of the mausoleum. In inventory, disassemble the clepsydra. Use the clepsydra on the waterfall (not on the pool water). Fill it to the 12 hour mark. Go back to the water lock on the mausoleum door. Use clay to plug the open hole on the right at front of the lock. From left to right: Place one hour or 1 click of water on the left, next 3, then 5 and 9 on the right. Fill the clepsydra when needed. The count can be checked using the bar that rises from each hole. Bad day - One of the plugs pops off. Use clay to plug the new hole. Statuettes: Enter the mausoleum. It's dark. Look down in front of the tomb and use lighter on the oil cavity on the left. Go to the God shaped containers on the right. Open each container and take Isis, Thoth and Anubis statuettes. Turn over the cover of the Anubis container on the floor and take the Horus statuette. Go to the opposite wall and study the soul weighing ceremony fresco. Isis is on the left, Thoth, the scale, Anubis and Horus at right. Now, you know how to arrange the statuettes. Library of Alexandria: Go to the library (either by map or exit the gate). Crocodile caretaker: Place the God figurines on the casket's black squares. 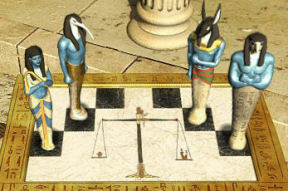 From left to right: Isis, Thoth, 2 empty black squares, Anubis and Horus at right. The mad crocodile caretaker makes a path to the door of the Great Library. Great Library: Go inside the library. Turn around and pick up the grappling hook. Turn right and see crocodile eggs in a basket. Go forward to the left side of the room. Look at the fire. Take the digging bar right of the lamp stand. Go forward. Look at the painting at far wall. Turn left and go forward to the corner. Take rope beside the crocodile. Look at the destroyed wall scroll slots. In inventory combine rope and grappling hook. At the center of the room is a crocodile with metal bracelets on its legs and a metal collar. Click on collar and Thomas says the necklace is resistant. Go to the sitting man. Talk to Kordax, servant to the Ptolemeics. He's a hunchbacked jester of sorts. He wants Thomas to get him get away from the mad crocodile caretaker. Look at the crocodile guarding or waiting for dinner in front of Kordax. Enter the room beyond Kordax. Room of rare plants - Look around. Turn right and pick up 4 piles (stacks) of 4 bowls. Look up on top shelf and take inventory of Ingredients scroll. 1. List of plants used as diluents or solvent by painters: in a basin of water add one handful of Lullibi flowers, 2 handfuls of Makkan seeds, 2 handfuls of Uruku roots and one handful of Amath leaves. 2. A Euclidean inspiration: The first four prime numbers will open the door. Based on the inventory of ingredients scroll, there are no Amath leaves. Pan right on the right shelf and use bowl to get: Lullibi flowers, Makkan seeds, gray nugget, red powder, gray powder, white powder, black powder and green powder. Turn around and use bowl to get: Uruku root, Meluhkha bone, Canaan thorns, orange powder, white powder, yellow powder, ochre powder and white nugget. Bad day - the gray nugget is moldy and can not be taken. There will be one empty bowl in the end. Laboratory - Go to next room. 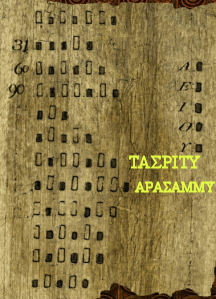 Take and read the Diomedes reaction scroll from the wall, the Zoilos reaction scroll on the left on top of the plank and the Prusias properties on the table beside the empty bowl. Ah there, Prusias scroll states that Amath leaves and Canaan thorns have the same properties. Click a bowl of ingredient on the holder and automatically place the bowls on the holes. All the holes should have a bowl. Turn right and pick up empty decanter from the shelf. Prepare the solvent - Use big empty metal bowl on the water on the right to get filled bowl. Add one handful of Lullibi flowers, two handfuls of Makkan seeds, two handfuls of Uruku roots and one handful of Canaan thorns. The solvent is done. Use the empty decanter on the bowl of solvent to get solvent. Great Library - Now, where to use the solvent? Go back to the Great Library. Columns - Go to the painting of the Ptolemeics at the back wall. Look down on the right and look close at the base of the column right of the painting. The column is painted to look like marble. Use the solvent on the base of the column to reveal triangle pointer, numbers and a hole. Do this to all the bases of the 4 columns. Look again and Thomas says it looks like it can be turned but needs power of a colossus. Place the digging bar on the hole. If you haven't done it yet, combine rope and grappling hook. Power of a colossus? Ah, but we do have one at the center of the room. Go to the giant crocodile with the metal bracelets and collar - Souchous. Very cute name! Hiss! Use the rope and grappling hook on Souchous. Aristion's clue stated: The first four prime numbers will open the door. The first 4 prime numbers are 2, 3, 5 and 7. Left column - Take the end of the rope and use it on the short end (back side close to the wall) of digging bar inserted in the first left column. The first column points to I. It should be turned once to II. Go back to Souchous but the old caretaker states that Souchous understands only the stick. Go outside and take Sobek's staff beside the Sobek statue. Use the staff on the crocodile. The column turns once and the arrow on the first column now points to II. Second from left column - The second column is at II. Untie rope and take bar from previous column. Insert bar, tie rope to the short end (back side close to the wall) of digging bar and tap Souchous once to get the column to point to III. Third from left column - The third column points to II and needs to be moved to V. Untie rope and take bar from previous column. Insert bar, tie rope to the short end (back side close to the wall) of digging bar and tap Souchous three times to get the column to point to V.
Rightmost column - The fourth column points to I. Untie rope and take bar from previous column. Insert bar, tie rope to the short end (back side close to the wall) of digging bar and tap Souchous three times to get the column to point to VII. Secret Chamber - The bottom part of the painting on the left opens to a secret chamber. Enter the secret chamber. Take the tablets on the chair. Sobek's guardian realizes that he was tricked. Find yourself in front of Kordax. Talk to him completely. Look around and see that both of you are cornered by the crocodiles. The guardian is in the secret room. Open the basket on your feet. Take the Soothing balm scroll. Take fillets of dried fish. Prepare the Sleeping draft - Go to the laboratory. Study the recipe in documents. Realize that you do not know which one is the Ashod resin in nugget form and which one is the white powdered Tjekker flower. Good day - There are 2 nuggets and there are 2 white powders. Bad day - There is one nugget but the gray nugget is moldy. There are 2 white powders. Read the Diomedes reactions scroll and see how to test for Tjekker flowers and Ashod resin. Empty the bowl of water by clicking it on the container on the left. Use empty bowl on the water on the right to get filled bowl. Add 1 handful of Mitanna gum from one of the top left containers, 2 handfuls of Arsawa powder and 1 handful of white powder 4th from left bottom row. If correct, Thomas will say: I identified one of the constituents. The bowl will then be labeled. Empty bowl and fill it with water. Add 1 handful of Mitanna gum, 2 handfuls of Arsawa powder, 2 handfuls of Pitasa gum and 1 handful of grey nuggets powder. Read the Prusias properties scroll that states that Ataniya roots and Ashod resin possess similar properties. Read the Zoilos reactions scroll to identify Ataniya roots. Empty bowl and fill it with water. Add 1 handful of Kerma powder, 2 handfuls of Arsawa powder, 2 handfuls of Pitasa gum and 1 handful of grey powder. Empty bowl and fill it with water. Add 2 handfuls of gray powdered Melukhka, 2 handfuls of Ashod resin (good day) or Ataniya roots (bad day) in nugget form, 2 handfuls of green powdered Canaan thorns and 2 handfuls of white powdered Tjekker flowers. Add fillets of dried fish to Kordax's concoction to make soporific fish. They will turn pink. Go back to the crocodile in front of Kordax and give it the soporific fish. Watch the 2 escape. Kordax stayed in the Observatory. Thomas meets with Cleopatra and the tablets were given over. Akkad and Iris are in the Isle of Pharos. There is an epidemic there. Thomas is to be given an antidote and sent there to save his mentor and lover. Isle of Pharos: Kordax' friends dropped Thomas at the Isle of Pharos. Thomas can contact them again using the horn hanging on a post beside the pier. Turn around from the lighthouse and see a pile of sand. You might need it later. Lighthouse of Alexandria: Go forward to the lighthouse passing a ladder and Cyclops-catapult-war machine. See a light signal on top of the lighthouse. It is similar to the heliolab. That must be Iris and her father. Go forward to the wall. Look at the wall that is partially destroyed by the war machines. See sand piles close to the lighthouse wall and note the dead soldiers behind the barricades. Cyclops - Catapult - War machine: Go back to the war machine. It needs to be reset. Catapult counterweight - Go to the front part of the catapult facing the lighthouse. Place the 3 sand bags from the ground in the counterweight bin. See that it still not full. If the counterweight is not full, the shot will fall short. Make new sand bags - Go to the galley that ran aground at the beach. Look at the galley. There's a beam on the sand. 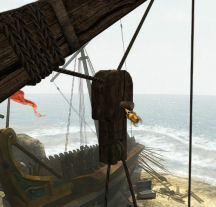 Look right and open the chest that contains the galley sails. Take needle and reel of thread and the fraying instrument. Use the fraying instrument on the sail inside the chest to get large section of sails. Use the fraying instrument on the large section of sails to get small strip of sail. Combine needle and reel of thread with small strip of sail to make bag. Make three bags. Go to the sand pile by the pier (or to the pile of sand close to the lighthouse wall). Use the 3 bags on the sand to get 3 sand bags. Place the 3 sand bags on the counterweight. If it is full, Thomas will say so. Winch - Go to the back wheel part of the Cyclops-catapult. Look down and see that the winch cable loop on the ground. Look up and see the winch to hold it is up on the beam. Turn around and pick up the ladder. Turn around and prop the ladder on the beam. Pick up the winch cable loop from the ground. Climb the ladder and attach the winch cable loop on the winch. Thomas says that it will not hold together and needs a peg. Go down and pick up the broken peg on the ground. Go to the galley. Open the galley carpenter's chest left of the beam. Take the hammer and chisel. Use the chisel on the beam to get piece of wood. In inventory, combine the broken peg, piece of wood, hammer and chisel to get new peg. Good day - The peg will hold. Bad day - The peg breaks and have to make a new one again. Climb the ladder and place the new peg on the hole of the winch cable to hold it tight. Load the catapult - Climb down the ladder and return the ladder to the boulder at other side. Go to the front part of the catapult and take the wooden frame with circular hole in the middle and the ball of stone from the ground. The wooden frame seems to fit around the stone. Go to the back part of the catapult. Turn the switch below the wheel to the left position to tighten the cable. Turn the wheel to lower the beam. Take the catapult sling that is lowered and place it on the beam at the middle of the base of the catapult. Place the stone ball on the sling. Take the hook attached to catapult sling and use it on the ring at end of the lowered beam. Fire the catapult - Turn the switch below the wheel and see that it is stuck. Use the hammer on the peg inserted on the lowered winch. See the ball hit and makes more damage to the wall. Go to the wall and check it out. See if you can get through the damage. Pick up the stone ball. Go back to the catapult and click to pick up the winch cable loop. Automatically, the catapult setup is done. Good Day - There's an opening to pass through. Bad Day - The stone ball is in pieces and you have to make a new one. Take rubble from the pieces on the top of the wall. In inventory, combine rubble, chisel and wooden frame to make a new stone ball. Fire on the wall again to make a bigger opening. Plaque: Look down and see a broken plaque on top of a boulder close to the wall. Pick up the plaque pieces from the ground. Put the pieces together with the broken plaque on the boulder. Inside the Lighthouse: Go through the opening on the wall. Turn left and pick up the chain mail from the floor. Go forward and try the metal door that leads up to the top of the lighthouse. It's locked! Apollo's chariot: Go to the other side of the room and look at the broken winch wheel. Automatically look up and see Apollo's Chariot (elevator) that rose to the top of the lighthouse. Name wheel - Look left at the inscribed metal plaque-wheel on the pillar. Good day - The wheel is intact. Bad day - The wheel is bent. Use the hammer to straighten the wheel. Click on the inscription below the wheel: You... who built this lighthouse, become the guardian of the sun chariot. Remember the broken plaque outside; it mentions Sostratos as the dedicator (builder) of the lighthouse. Click at center of the wheel. It opens. Take the letter of the kidnapper to the 'favorite of the King'. Sounds familiar. Learn the fate of Iris and Akkad. Apollo's chariot - Pull the lever and the counterweight is dropped. Go to the counterweight. Let's find out what weight balances the chariot and the counterweight. Good day - All the weights are intact. Bad day - Some weights are broken by the soldiers. Take all of the weights from the counterweight cage and place it beside the other weights on the stone shelf. Thomas says that the counterweight and chariot seem to weigh the same. The chariot dropped to the ground now that the counterweight is lighter. Now to even the weight of the chariot and the counterbalance. Good day - Place 11 weights on the chariot. Bad day - Go back outside and take 3 sandbags from the catapult's counterweight. Place 6 weights on the chariot and the 3 sandbags. Take the rope hanging at right to lower the counterweight. The rope will automatically be tied to the ring on the floor. Now place the rest (10) of the weights in the counterweight box. This makes the cage just a bit lighter than the chariot. Untie the rope and the heavier chariot goes down. Enter the chariot! Take the weights off the chariot while you're on it and place them back at the ledge and place the sandbags on the floor. When you-chariot gets lighter than the counterweight, you rise up to the top. Hydra chamber: Where is Iris? Go up the stairs to the Hydra room. Winch: Go to the left and see a winch on a stand with depictions of 3 Gorgon heads. The winch is blocked and cannot be turned. Read the inscription on the winch stand. Three Gorgons guard the sun, call them and the light shall be yours. Look up to the ceiling and see the Great Prism. It looks low. The winch is used to lift the Great Prism. Go to the other side with a hole on the floor. Look up and see a basket up there. Go to the center of the room and Iris will call out. Talk to Iris completely. A hunchback! Now, that is quite a coincidence. 3 Gorgon Sisters: Based on the inscription, we need to know the names of the 3 Gorgons to call them. Where did we see the Gorgons mentioned? Plaque - Exit the room and go down the stairs. Remove the bar holding the metal door and go to the main door. Go back out to the broken plaque. In inventory, combine the chain mail, the wooden frame and the reel of thread to make a sieve. Use the sieve on the 2 piles of sand left of the broken plaque until Thomas says that's all the pieces that can be found here now. Put together the plaque and see if you need to look for more pieces. If you need more pieces and have used the sand close to the wall when making the sandbags, pick up 3 sandbags made from the catapult counterweight. Empty the sandbags on the sand close to the wall. Sift through the sand to get the remaining pieces. Put the pieces together to form the plaque. Read the completed plaque. The document shows the name of the 3 Gorgons in red: Medusa, Euryale and Stheno. Enter the name - Climb back up the stairs to the top of the lighthouse. Go to the center of the room and see a ring of Greek letters on the floor. 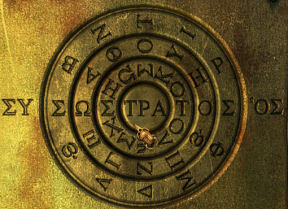 Enter the names of the 3 Gorgons by pressing on the Greek letters. Verify the letter by the label at top right of the screen. The letters on the floor do not repeat, so once it is pressed down, continue to look for the next letter to be entered. Thomas will say when the name is finished. Medusa: mu, epsilon, delta, omicron, upsilon, sigma, eta. And a renowned Gorgon at that! Euryale: 'epsilon (with apostrophe), rho, alpha, lambda. Two Gorgon names down. Stheno: theta, nu. The Gorgons are defeated! Great Prism: Use the winch to raise the Great Prism. Panels: Go to the center of the room and look up at the Great Prism. Note that there are 3 areas that do not have a raise panel that looks brown. Click on the area with no brown panel and Thomas will know that the rope can be raised for that area. Look-move down while following the column and then the rope down to the end on the wall in front of you. Then pull that rope and the panel will be opened. Iris comes down from the top of the lighthouse. So Kordax is the head of the kidnappers? They (actually Iris) reached a decision to stay and do Cleopatra's divination. Cleopatra agreed that Iris do the divination. Terrace: Talk to Iris twice completely. Look at the heliotrope and see that the rod is missing. Go down the steps. Hear Kordax call out. Turn around and see - take the part of a mask from the bottom step of the stairs. In inventory, click the 2 masks together and see that they are parts of one. Go back up to Iris and talk to her. Now, Iris is sure that Kordax is the murderer. Reception room: Go down and enter the reception room. Talk to Kordax completely. Told 'ya! Go back to the terrace and talk to Iris. She needs to find Akkad's secret observatory in the mausoleum to use the proper instruments. The medallions in Akkad's crown are the key and the frescoes in the tomb would show the way. Iris decided to poison the nail biting Kordax. Go back down and talk to Kordax. Pick up his washbowl. Turn around and take the Fragrance formula from the table by the wall. Library of Alexandria: Use the map to jump to the library gardens. Garden: Go to the end of the pond. See that the old crocodile caretaker is dead. Take Sobek's staff and use it on the crocodile. Enter the library and go to the laboratory. Laboratory: Using the scrolls as reference, identify all the ingredients. Mitanni gum produces a white smoke. Kerma powder makes water boil briefly. Arsawa powder produces a black smoke. Pitassa gum produces a brief red coloration. Identify all the ingredients - Using the Zoilos reactions scroll, test the different unlabeled powders. Empty bowl and fill it with water. Add 1 handful of Mitanni gum and 1 handful of yellow powder. It is identified as Nuzi leaves. Empty bowl and fill it with water. Add 1 handful of Mitanni gum, 2 handfuls of Pitassa gum and 1 handful of orange powder. It is identified as Ashur leaves. Empty bowl and fill it with water. Add 1 handful of Kerma powder and 1 handful of ochre powder. It is identified as Kassite bark. Empty bowl and fill it with water. Add 1 handful of Kerma powder, 1 handful of Arsawa powder and 1 handful of green powder. It is identified as Masa thorns. Empty bowl and fill it with water. Add 1 handful of Kerma powder, 1 handful of Arsawa powder, 1 handful of Pitassa gum and 1 handful of black powder. It is identified as Teresh roots. Empty bowl and fill it with water. Add 1 handful of Kerma powder, 2 handfuls of Arsawa powder, one handful of Pitassa gum and 1 handful of white powder. It is identified as Ekron leaves. (Done already on bad day) Empty bowl and fill it with water. Add 1 handful of Kerma powder, 2 handfuls of Arsawa powder, 2 handfuls of Pitasa gum and 1 handful of grey powder. It is identified as Ataniya roots. Empty bowl and fill it with water. Add 1 handful of Mitanni gum, 1 handful of Kerma powder, 2 handfuls of Pitassa gum and 1 handful of red powder. It is identified as Askelon leaves. Top row (left to right) : Lullubi flower, Makkan seed, Melukhka bone, Uruku, root, Canaan thorns, white nugget, Nuzo leaf and Ashur seed. Bottom row (left to right): Kassite bark, Masa thorn, Teresh, roots, Tjekker flower, Askelon seed, Ashod resin, Ekron leaf and Ataniya roots. Make the poison: Using Kordax' soothing balm double recipe and the fragrance formula scroll, prepare the poisoned water. Empty bowl and fill with water. Add 2 handfuls of Melukhka bone, 2 handfuls of Ashod resin or Ataniya roots, 2 handfuls of Canaan thorns, 2 handfuls of Tjekker flowers. What a stench! To the above sleeping draught, add the fragrance formula. Add 2 handfuls of Nuzi leaves, 1 handful of Ashur seeds, 2 handfuls of Kassite bark, 2 handfuls of Masa thorns and 1 handful of Teresh roots. Empty Kordax' washbowl that is in inventory on the container left of the ingredients. Use the empty washbowl on the fragrant sleeping draught to get poisoned and fragrant washbowl. Observatory: Jump to Akkad's workshop. Reception room: Go to the reception room. Place the poisoned and fragrant washbowl on the table. Good day - Kordax falls asleep. Bad day - Kordax will say how he learned from King Mithridates how to be immune to poisons. Go back to Iris and talk to her. She says her bracelet has poison that is not well known to even an assassin. The bracelet needs to be dipped in a solution of Melukhha bones. Library Laboratory - Jump to the Hall of the library and go to the laboratory. Empty bowl and fill with water. Add 1 handful of Melukhka bone. Use Iris' bracelet in the solution. Empty the poisoned washbowl on the container left of the ingredients. Use the empty washbowl on the poison to get poisoned washbowl. Jump back to Akkad's workshop and go to the reception room. Place the poisoned washbowl on the table by Kordax. He falls asleep. Open the bag on the floor and take the heliotrope and half of Akkad's crown. Take the horn and automatically blow the horn. Go back to Iris and talk to her. Mausoleum: Jump to the mausoleum. Iris said the medallions in Akkad's crown are the key. In inventory, combine the 2 halves of Akkad's crown to get Akkad's crown, the Aries medal and the Taurus medal. Look at the fresco facing the door. It shows Aries on the right and the Taurus on the left above a barge where Iris is sitting on. Go to the back of the structure. See a barge with 2 men holding their hands out. Place the Aries medal on the right man and the Taurus medal on the left man. Hear a noise. Go back to the front part and see that the slab recessed. It exposed a circle made up of astrological signs and 2 hands (moon and sun). Some of the astrological circles are covered. The frescoes in the tomb would show the way. Look at the frescoes on the sides of the structure. Capricorn, Sagittarius and Aquarius are on one side. Scorpio, Cancer and Gemini are on the other side. Go back to the astrological circles. Move the sun and moon so that Scorpio, Capricorn, Sagittarius and Aquarius are exposed on the left and Cancer and Gemini are exposed on the right. This happens when the Sun is at 12 o'clock position and the moon is at 7 o'clock position. In inventory, combine Akkad's crown and the small pliers to get all the rest of the crown's medallions. Place the Scorpio, Capricorn, Sagittarius, Aquarius, Cancer and Gemini medallions in their proper place. Take note that there are 4 holes in each medallion. There are rods on the 4 corners framing the circles. Go to the frescos and study each one. Take note that each of the 6 frescos has demons and astrological sign depicted. Look at the frescos again. Note the placements of the demons of each of the 6 astrological signs. Go to the front and insert rods on holes of each medallion using the position of the demons as guide. Do this to all the 6 astrological sign. If done correctly, hear a sound and the entrance to the secret observatory is opened. Top left - TL, Top right - TR, Bottom left - BL and Bottom right - BR. Capricorn - TL, BL, BR. Sagittarius - TL, TR, BR. Cancer - All holes should have rods. Secret Observatory: Go to the back side of this structure and see steps going down. Look right and see the last fresco. Open the small casket on the left wall. Take and read Akkad's last will and testament. So we need to raise the observatory to the roof. Look at the chest with a Libra sign on the cover. Use the Libra medallion on the circle. Open the chest and take the moldboard tube and Heron's letter to Akkad about the Titan. Go forward and see the Titan set up on the right. Go forward to the platform at end of the room. Take the gangway at right before climbing to the platform. Climb to the platform and look at the 3 astrological instruments. Take the beam at left side of the platform (bad day only). Thanks, GeeGee! Titan: Go back to the machine. Talk to Iris. Light up the Titan - Open the 2 grills of the furnace. Use the lighter to start a fire on both sides. Pull the handle bar over the furnace and the other handle bar over the coal-heliolites on the left. This will vent the smoke out. Go back outside and go to the Horus and Anubis statues across the mausoleum. Remove the cover of the vents to release the smoke outside. Fill the water basin: Go to the area close to the wall where the Eros with the arrow is located. Face the pond and see the 4 hippos at the middle of the pond. It's an overflow. Place the gangway to cross to the hippos. Cross over and look down. See the overflow to the secret observatory. Good day - The drain is unblocked. Bad day - The drain is covered by a trapdoor. Use the beam twice on the trapdoor that blocks the overflow. Pull up the sluice gate at top of the overflow. Water pours in the secret observatory basins. Go back to the secret observatory. A crocodile blocks the walkway. Use the Sobek staff to send it on its way. Make steam power: Be sure that the furnace domes are closed. Look at the post right of the furnace. Insert the Pisces medal on the circular slot between the sun and moon. Press the moon and the big container on the right goes down and fills with water. Automatically, press the sun and the big container filled with water rises. Insert the moldboard tube on the pipe on the left (behind the post) to connect the furnace dome with the water container. Pull up the valve on the wood end (water container) of the moldboard tube to release water to the furnace dome. Open the grill doors and see if you can now add heliolites (coal) to build up the fire. Add 5 scoops to each side or until Thomas says there's enough on both furnaces. Release steam to power the platform: Go forward just below the platform. If the furnace is done correctly, see steam come out from top of the machine at right. See 3 circles that stop the rotation of a wheel. This wheel turns to raise the platform when the steam powers it up. Turn around and unlock the chest by placing the Leo medal on the circular slot. Good day - There are 3 disks inside. Bad day - The chest is empty. Go back to the heliolites bin. The removal of some heliolites from the bin exposed a sack. Open the sack and take the fire disk, air disk and water disk. Face the machine by the platform. Insert the Virgo medal at the center. Place the air disk at top, fire disk at bottom left and water disk at bottom right slots. Watch the platform rise to the roof.